It is our painful duty this morning to record the most terrible marine disaster that has ever occurred on our coast—the loss of a great ocean steamship with about 750 lives. 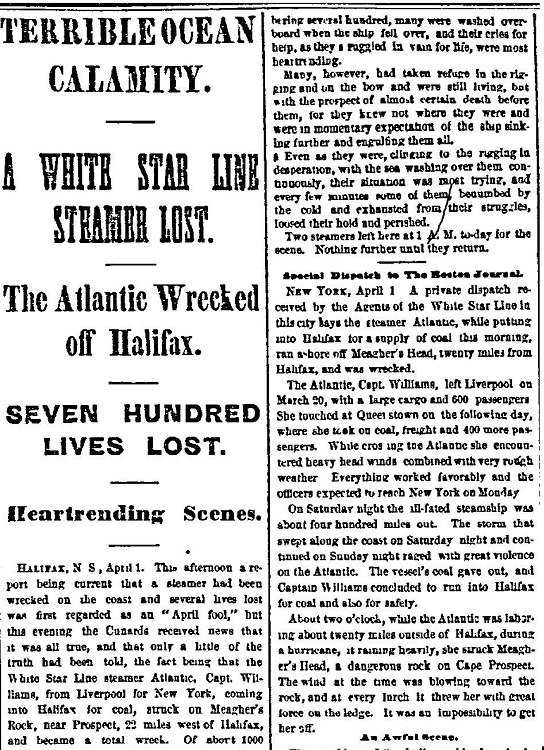 The White Star steamer Atlantic…while coming into this port [Halifax] for coal, struck on Meagher’s Rock, near Cape Prospect, 22 miles west of Halifax, and became a total wreck. Of about 1,000 souls on board upwards of 700 were drowned. The third officer, Brady, arrived in this city this evening. He says that the Atlantic left Liverpool on the 20th of March with upward of 900 steerage passengers and about 50 cabin passengers. The steamer experienced boisterous weather during the passage, but all went well till noon, Monday, the 31st, when the supply of coal became nearly exhausted and the captain determined to put into Halifax. The New York World offered additional details about the Atlantic’s attempt to enter the Halifax port. But while thus endeavoring to reach that haven of safety a fierce gale of wind and rain drove her with terrible speed shoreward. The engines, made weak with their short allowance of coal, vainly worked against the driving waves and seas. 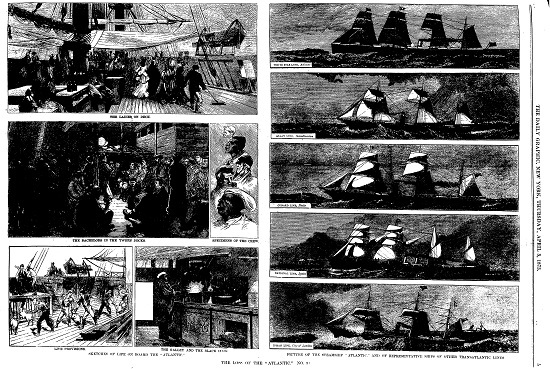 The ship was driven to the shore and struck on Meagher’s Head. A fearful scene of despair, confusion, and death ensued. In the wild, savage struggle for life some 250 of the men upon the vessel managed to make a landing and so saved their lives; but 750 of the numbers upon the ill-starred ship were drowned or were dashed lifeless against the rugged beach. Not a woman or a child upon the ship was saved. When the water commenced to come into the steerage the passengers made for the hurricane deck. The captain shouted for many men who had life-vests…to rush into the sea or mount the rigging, as these were the only chances for life. Leahy and his chum immediately ascended the rigging after much trouble, and from thence had a good view of what was going on. “Then,” said he, “I saw…an awful sight. It was just gleaming day. A large mass of something drifted past the ship on top of a wave, and then was lost to view in the trough of the sea. As it passed by a moan – it must have been a shriek, but the tempest dulled the sound – seemed to surge up from the mass, which extended over fifty yards of water….Leahy was in the rigging seven hours moving up and down to keep his blood in circulation. He saw men on both sides of him fall from exhaustion….The chance of escape was by means of a rope to the shore, which Mr. Brady…swam ashore with. Nearly half those who ran the risk of crossing on this lost their lives. Brady went to bed about the same as the captain. The next thing that he remembers is that he was thrown out of his bunk, and he felt the ship strike several times. He then rushed on the deck and found the captain and officers there and the deck full of passengers. He got an axe and commenced to clear away a boat. The captain and other officers were busy doing the same thing. Brady got his boat out and put two women in it. A number of men attempted to get into it, and about a dozen succeeded. Just at that moment the steamer fell over on her beam ends and sank. Only one boat had been got out, and that was carried down by the steamer and all on it were lost. Brady scrambled in to the mizzen rigging which was above the water, and seeing that he could do nothing there he then went forward and unwove the halyards, being assisted by Quartermasters Speakman and Owen. Brady then took the halyards, and all three swam to the rock, and there a line was hauled ashore and a number of the passengers landed by it. 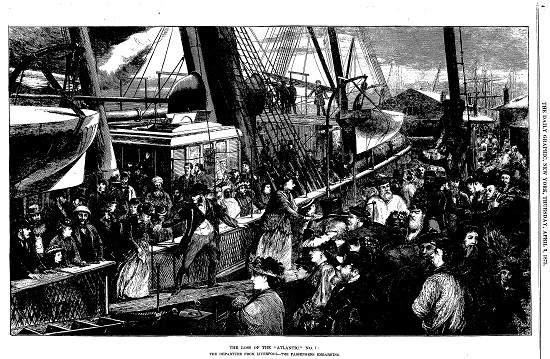 …the agents of the White Star Line sent the Atlantic to sea with a scant supply of coal because it was high in the English markets, and her pilot stupidly mistakes one light for another, while the captain leaves his post and goes below in the thickening perils of surf and storm….In a case where nearly a thousand lives are at stake the neglect of a single precaution is a crime of the first order, and a blunder is a thousand possible murders. 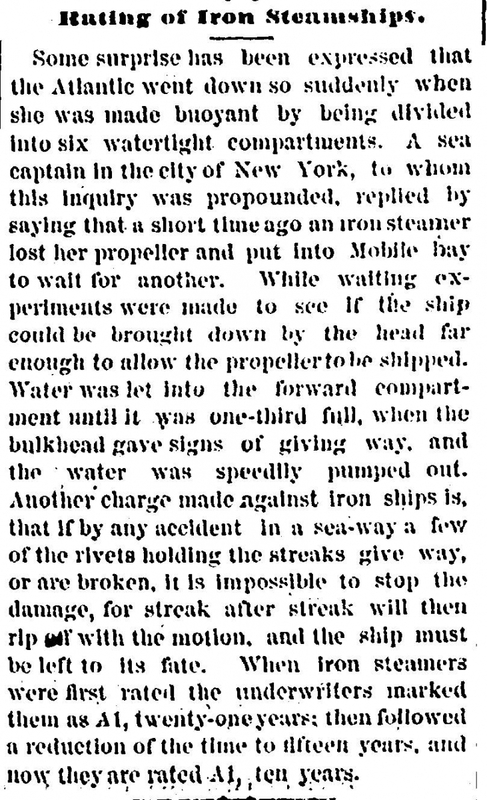 “The Perils of the Sea,” published by The Charleston Daily News, raised wider concerns about the ocean steamship business model. 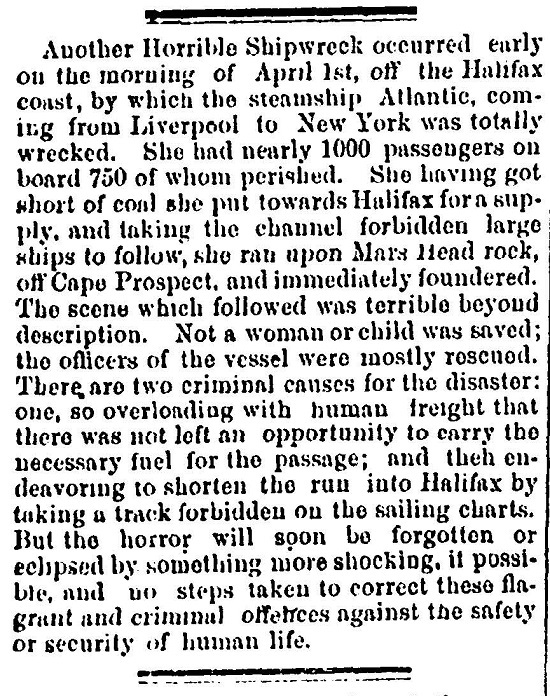 The appalling disaster which has overtaken the White Star Line steamer Atlantic will not surprise the persons of experience who have watched, with increasing alarm, the rivalry between the ocean steamship lines, and the systematic disregard, in building new vessels, of any other consideration than the securing of a high rate of speed. In advance of full details, and complete explanation, we venture the assertion that this ship had two terrible faults, characteristic of all the British steamers recently built. In the first place she was made of brittle, cheap iron. Thus far our American builders have used good iron, and one of the reasons why our foreign competitors have built ships for less prices was, simply, that they used bad material. 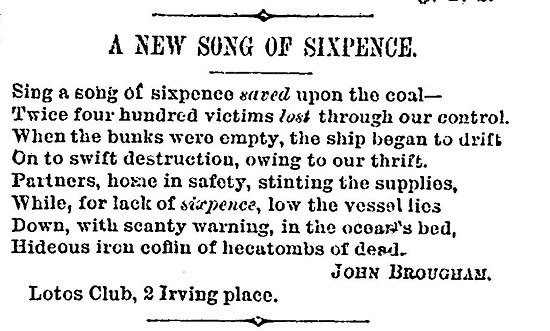 Now in consequence of this, when a ship strikes on a shoal or a rock, it is fatal. 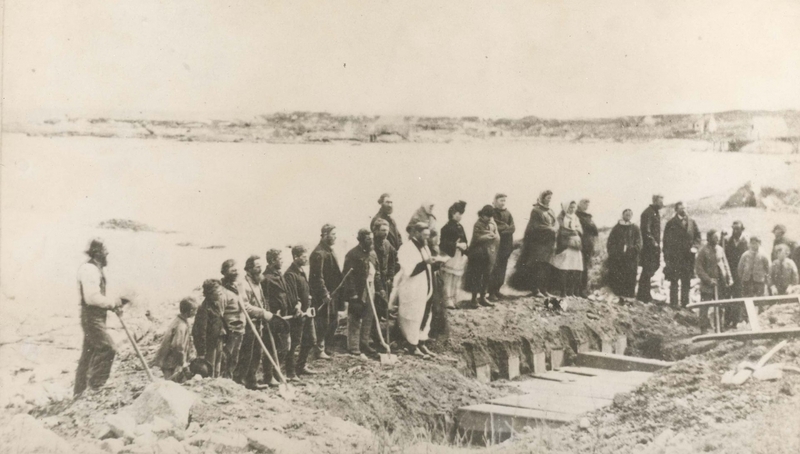 For instance, the iron steamship Sir Francis, English-built, recently went ashore between Boston and Portsmouth, and when sold for old iron, it was found to be so worthless that the buyer was almost ruined by the purchase. 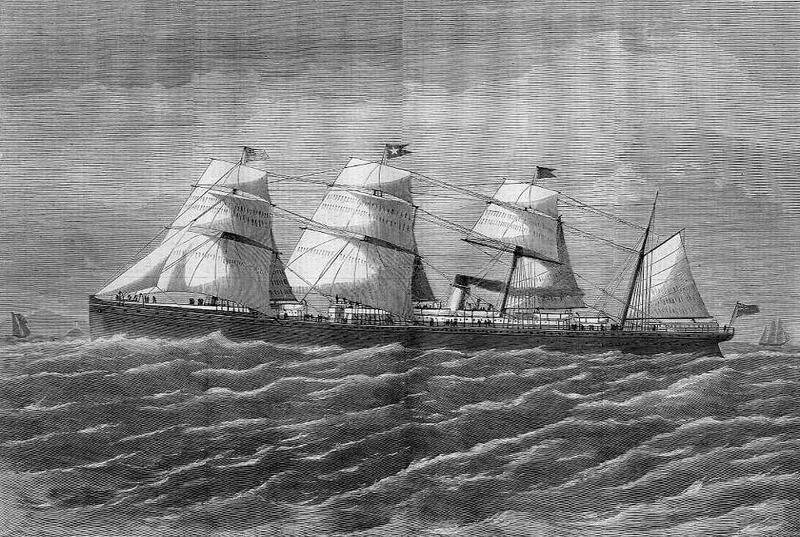 On the other hand, the Juniata, of Philadelphia, a staunch, well-built ship, with good iron in her sides, went ashore on the Florida beach, in 1871, worked herself off, and steamed to her home port, needing moderate repairs, only. But the horror will soon be forgotten or eclipsed by something more shocking, if possible, and no steps taken to correct these flagrant and criminal offences against the safety or security of human life. 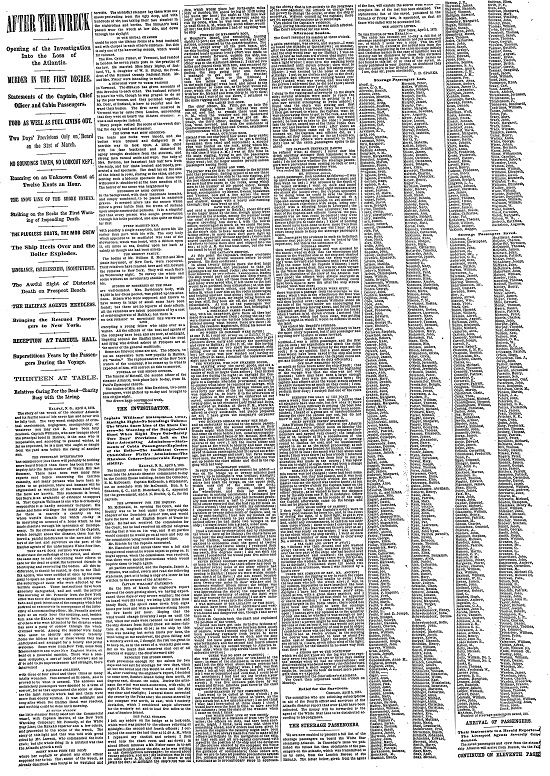 Many additional articles pertinent to the disaster are found in America’s Historical Newspapers. 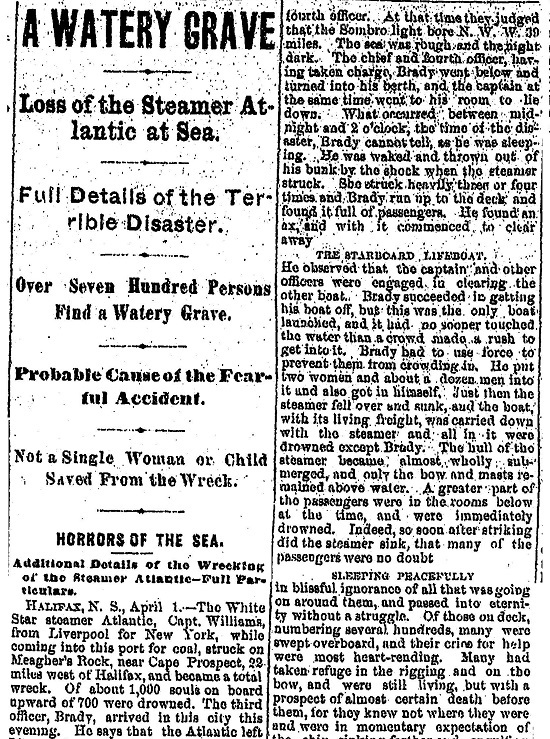 The 1873 sinking of the RMS Atlantic on its 19th voyage represented the deadliest peacetime ship disaster until the 1898 sinking of SS La Bourgogne, a French ocean liner. It also remained the deadliest disaster of the White Star Line until 1912 when the Titanic went down. For more information America's Historical Newspapers, please contact Readex Marketing.